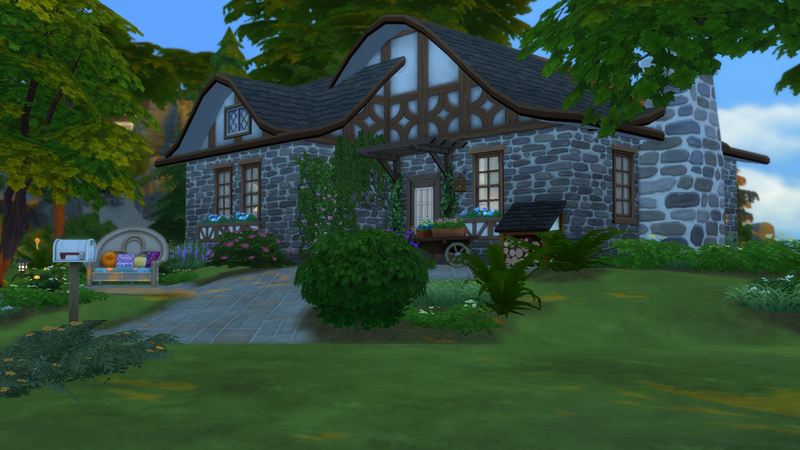 ENTRY DETAILS: 220 Lovers Lane is a secluded stone cottage on an island in Windenburg Bay. Ideal for moonlit walks on the beach and afternoons lounging in the warm sun enjoying the bracing breeze from the bay. The seclusion is ideal for romantic escapades or inner contemplation or..... a serial slasher. Did you meet the neighbor? I believe his name is Jason... or was it Michael? Hmmm. Anyway have fun! I sat this one out as I didn't feel the vibe for it...hopefully the next one will speak to me. Attention EXPERT, STARTING OUT & ESTABLISHED Entrants... All of the remaining results are available starting HERE. Help! I rotated the lot for a better view from the front door, but now when I go to save to the gallery, it's showing the lot from the back of the cottage. Crazy thing! Anyway, is there any way to get it to showcase the lot from the front of the house rather than the EA coded (apparently) "front" of the lot? Edited to add: When I try rotating it back to proper position, it refunds some of my landscaping (I don't know why, since it's all on the lot without MOO) and I can't purchase it back because I playtested and don't have enough funds to purchase new landscaping. :sigh: This build might have to just go on without my entry, since I don't know if I'll have enough time (it's currently two hours til the deadline) to get it all fixed, entered, and listed here. @Faoiltearna the gallery upload is only used to verify the budget. All of the judging is done from your photo slideshow. Yeah, I get that, but I'm also figuring that anyone who sees this upload is only going to see the back of the house. Ah well, I'll see if I can get the pictures edited and get it uploaded. ENTRY DETAILS: In the Panhandle of Florida where I'm from, there are several modern beach communities along Hwy 30A like Seaside and Water Color that are planned communities with bright, pastel houses in a typical beachhouse style. That's where I drew my inspiration for this Love Shack. It's a tiny one bedroom/one bath - cozy but with all the ameneties a honeymooning couple would need. Hot tub did you say? Of course! Your lovebird sims can have a soak and enjoy the ocean view, or whatever else they may feel like getting up to It's nestled right near the water, perfect for romantic strolls on the beach. My first build ended up appearing sideways in the gallery pics. Didn't stop anyone from downloading it. Don't worry, people can still see the other pictures and make a decision about whether or not they like/want it from those. Thanks! Editing and hopefully uploading soon! 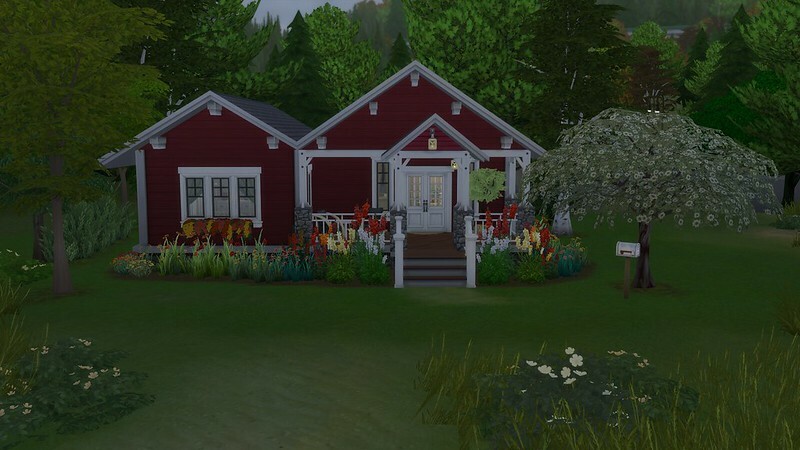 ENTRY DETAILS: This little cottage by the Brindleton Bay seaside is just the thing for the couple in love! A small kitchen and dining room, a large fireplace for snuggling in front of, and a built in spa-tub to relax in. Bookshelf and fishing close by for those times when you just want to do something quiet. Thanks! I got it in! #BnS112 Love Shack is closed! You sit back at your desk and smile. The last project took a lot out of you, but you are so happy you could help. You think back on many of your clients and how pleased they were with your work. But really, you could use a bit of a break, you think. Karl comes in and hands you a stack of mail. You motion for her to sit as you flip through it, mainly bills and junk. “So, who’s next?” you ask. “Oh?” He perks up, as curious about why he doesn’t know this as he is about who the client is. “But you love that house!” Karl protests. This challenge will be quite different. This month we are asking you to build your house in the game. No, not your dream house, your actual real house. To the best of your and the game’s ability, we want you to build the house, apartment, or residence you currently live as close as you can. Then, give your home a makeover! Do not add, remove, or change any exterior walls. This includes adding detached structures - no exterior walls can be added or removed. The exterior structure of the building must stay exactly as it is. You can swap a door for an arch of the same size and vise versa. You can swap windows for the same size windows. Fences and half-walls can be added, changed or removed. No other changes are allowed to the exterior structure of the home. Beyond that, you are free to change the type and style of floors, walls, any built-ins like cabinets and plumbing, you can repurpose rooms and change the interior layout if you wish. Take before and after shots to show us how you have reimagined your home! Take enough to really give us a feel for how it is now and how you envision it in the future. There is no budget for this build! There are too many various homes to try to limit it - this challenge is all about the before and after. Because of the dual build you will have THREE weeks to work on this challenge. Are YOU due for a personal makeover? Need a new hairstyle? A new fashion sense? Now's your time to make it happen. 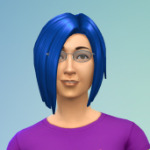 Show us your current simself and how you'd like to make yourself over. Don't have time to do over the whole house? Pick the room or area (like an bedroom/ensuite or open plan kitchen/dining) you'd most like to update and make it happen! Please use the whole of hashtag #BnS114 when you upload your creations, any build, room or household without this hashtag will not be judged. • Make sure your lot creates a thumbnail of the building from a front view. 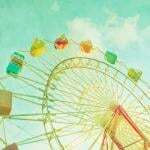 • Do the 'change season' cheat to get to summer and wait for a non-rainy day. • If you need to add an item that the sim living in the house cannot get (a reward/career item) you can move them out, add the item in the editor, then move them back in. 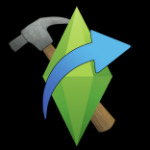 • If your tester sim(s) needs more money to move in you can use motherload, 'free real estate', (https://www.ea.com/games/the-sims/the-sims-4/pc/how-to-cheat), add a sim with money to the household, or move one of the sims in and out to their own household saving in-between then re-add them to the household. This gains $20,000 each time. • I find the new terrain height tools challenging sometimes when building to upload to the gallery. I test and test to make sure my lots place right without MOO active (which means I must give up or adjust some placements/items), but there are limitations to how well placement works on download from the gallery with some terrain height adjustments on a lot. I've found that most of the time (but not always - not on a few touchy lots) if I use the terrain height tools on a lot, if I go around the lot and make sure that the first of the editable square tiles on the lot is flat I can avoid placement problems. In other words, then your height adjustment is not all the way to the edge of your 'buildable' ground. 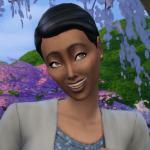 • Similarly, some features will be messed up when you turn the lot or house with some builds and on some lots. Most of the time if you don't have terrain height tools in use on the lot this is not an issue if you make sure all of the build' content (home, landscaping, etc.) is green not red/yellow before clicking for the placement. 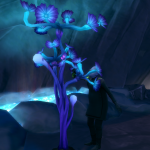 • Test everything that the sim will need to interact with. 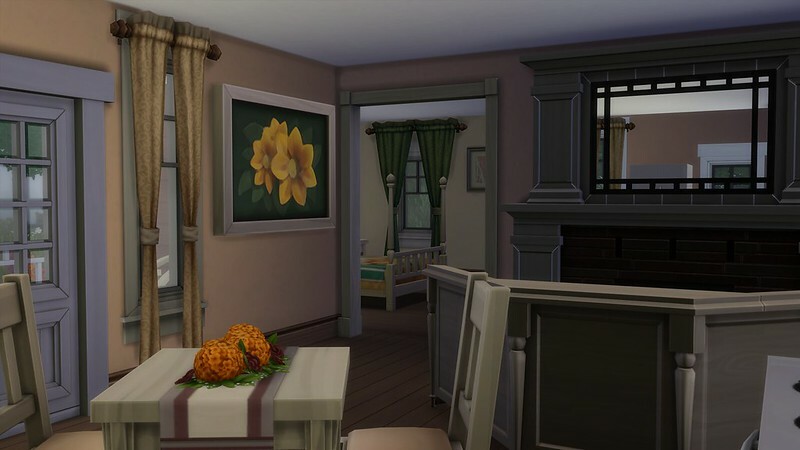 Nobody wants to download a lot and find out that their sim cannot use the stove, the bathroom, make coffee, get into bed, light the fireplace, etc. • I 'help' on a forum and build. I also code and design irl, and I get it that it's fun to add mods and cc... but I don't. Not because I wouldn't have fun with it, but because it can be a can of worms, it would need to be well maintained by the user and the creator, and it can seriously mess up your game sometimes. I'm too much of a control freak to lose my progress, and am not motivated enough to take the time to properly monitor updates and buggy stuff from Mods/CC if it pops up. In the help forums this is the case very frequently (that posters with issues have an issue caused by Mods or CC), and amidst the 'helpers' I have found that many refuse to use Mods and CC's for the same reasons I don't. We know that it can throw a monkey-wrench into your game that you may or may not be able to fix without losing some of your progress. Personally, I just don't want to deal with that or risk it, and I am very much not wanting to take any chance of uploading something to the gallery with any iffy code or functionality in it. I super-appreciate any players who will download or use a build I make and I want to take care of them. Sorry to go on and on, but I thought there may be a few things in that list that may be of use to someone else. It's a weird split level. It's an old building that was divided into apartments. So I'm at the top of the building. You enter my door to a small landing. Then 5 short stairs down a narrow stairway to the main room. Kitchen on the left, living are straight ahead. Then a dogleg to the "bedroom" area and then the bathroom. But there is also this weird platform to the right after you get to the end of the living area and reach the out side wall. Hard to explain without a drawing. So, not sure if I can actually recreate my place. My build won't be perfect, either, because our "apartment" in the basement has one ceiling unfinished and one where the support beam across the ceiling was walled in (don't ask XP), and the game doesn't let us do ANYTHING with the ceilings right now. I also have a walk-thru closet to my daughter's room that makes NO sense and gets real people trapped in it, so I know it'd end up either unusable or a sim trap in-game. XD We also have a weird staircase, similar to your situation - it's regular stairs that go down to a small landing, then turns a 90 degree corner and drops two more steps into the actual basement/our living area. XP It's a nightmare for taking furniture up and down, and I'll probably have to create a whole "sunken room" for the entire level to make it work. It could show what you would do if you could remodel for your in-laws. I did a shortened version of no one for 91, my first challenge. The new terrain tools ought to let me do it properly on a larger lot. Oh! It has a shed, should I include that, @BuildnShare? 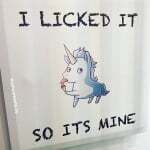 It will leave a blank space in the yard otherwise. I think the bit that's going to give me grief is the step separating the live room from the mudroom space which also contains the basement stairs. Which in turn has windows. Least I have some practice making daylight basements. And a single round step. I think I can make a pair of circular foundation work. I'm already trying to figure out if I can get the garage connected to both the dining room and the mudroom. One step down from the living room= mudroom. Two steps down from mudroom - garage. One step back up on different wall + dining room. One step up again = kitchen, whcih fortunately is level with the living room.